On September 29th, Sandos Hotels and Resorts participated in the International Coastal Cleanup, an annual event sponsored by the Ocean Conservancy, to clean and care for beaches and waterways. We thank all of our Sandistas for volunteering their time in this important event. Again, this year, we reached our goal of having 50 Sandistas participate in this very important ecological cause. The data from our effort has been delivered to SOFEMAT so we can track the impact Sandos Caracol has generated in this very important international cleaning and so we can also learn more about how to control waste in our oceans and waterways. s important event. 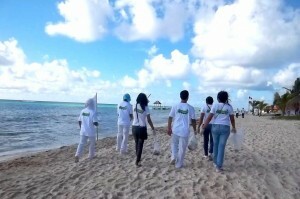 Again, this year, we reached our goal of having 50 Sandistas participate in this very important ecological cause. The data from our effort has been delivered to SOFEMAT so we can track the impact Sandos Caracol has generated in this very important international cleaning and so we can also learn more about how to control waste in our oceans and waterways. We are very proud of this work and congratulate and thank our hotel staff for their efforts.